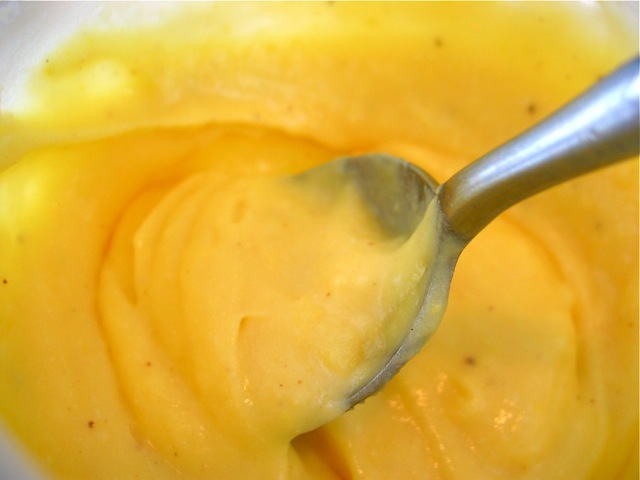 This warm, rich custard sauce adds a lovely grace note to bread pudding, pies, and other doughy English desserts. It's not a classic crème anglaise, which uses milk instead of cream, but it's delicious nonetheless. In a small bowl with a pouring spout, mix the yolks and sugar together. In a heavy saucepan, slowly heat the cream. When hot but not simmering, stir a bit of the cream back into the yolk-and-sugar mixture and blend until smooth. Pour the smooth yolk/sugar/cream mixture back into the saucepan and whisk it evenly into the cream. Cook the sauce for 10 minutes on low to medium heat. Once the sauce thickens, remove from heat and whisk in the flavorings. Serve warm.